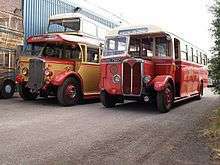 Aston Manor Road Transport Museum is an independent transport museum in Aldridge, Walsall. 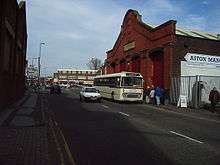 Until December 2011 the Museum occupied the former Birmingham Corporation Tramways' Witton Tram Depot, in the Aston district of Birmingham, England, run by a registered charity. The museum hosted the 40th birthday party of Charles, Prince of Wales on 14 November 1988, when he formally opened the museum. Following a decision by Birmingham City Council to cease funding the rent on the Witton Tram Depot, it closed in October 2011 and between then and December that year, the collection was moved to the Beecham Business Park, home to the former Jack Allen dustcart assembly plant, in nearby Aldridge,. Subsequently, the museum moved again, this time a short distance within Aldridge, to its present location in Shenstone Drive, Aldridge, where it opened to the public in July 2013. Since reopening, the museum has retained its bus collection but also added an increased number of light commercial vehicles on display. ↑ Charity Commission. Aston Manor Road Transport Museum, registered charity no. 519216. 1 2 "Prince Charles called on to support Aston Manor Transport Museum". Birmingham Post. 2011-09-20. Retrieved 24 December 2011. ↑ "Latest news on the future of the Museum". Aston Manor Road Transport Museum. Archived from the original on 11 December 2011. Retrieved 24 December 2011. ↑ "Aston Manor transport museum to close as council rejects offer to buy building". 2011-08-25. Retrieved 24 December 2011. ↑ "Facebook status update". Aston Manor Road Transport Museum. 2011-12-23. Retrieved 24 December 2011.